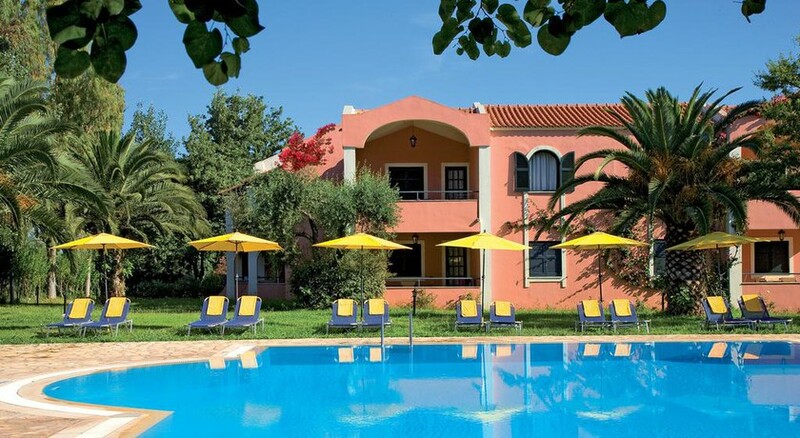 Located on the sun-soaked island of Corfu, Gelina Village Resort is a big hit with families looking for fun in the sunshine. Close to the gorgeous Blue Flag beach of Acharavi, and with the Hydropolis Waterpark right next door, there is plenty to keep everyone happy at this resort. Food-lovers will enjoy the authentic Greek cuisine at the Greek Taverna, enjoy drinks by the poolside, barbecue beach parties and themed nights in the evenings. The hotel is great for a family holiday, with an outdoor swimming pool, bars, restaurants, fitness rooms, and a spa. If you want to add a bit of activity to the mix try a game of tennis, beach volleyball or go windsurfing and canoeing in the warm waters. The Gelina Village Resort is located in front of the long sand and shingle Acharavi beach and next to the Hydropolis Waterpark and sports centre. It’s 39km from Corfu Airport, about a 40 minute drive. The hotel offers several categories of rooms, including 120 four-bed suites, 61 five-bed suites, 20 six-bed suites, 16 luxurious suites with double bedrooms and bathrooms, 9 maisonettes on the beach (double bedrooms and double bathrooms) and 56 three-bed studios. All apartments have balconies that overlook lush gardens or the blue waters of the bay. Sample authentic Greek cuisine in the main restaurant or at the Greek Taverna that specialises in grills and traditional dishes. Enjoy an early breakfast buffet in the main restaurant in the main restaurant, followed by an American buffet, Late Continental Breakfast, the Lunch Buffet and Dinner Buffet. The Pirates Beach Bar serves delicious soups and sandwiches, pizzas three times a week, as well as coffee and cake at the Lobby Bar and Pool Bar. For drinks, take your pick from the Captain's Lobby Bar, Odysseus Pool Bar, Pirates Beach Bar and Nereides Pool Bar. There are plenty of fun activities to choose from at the Gelina Village Complex, with an outdoor swimming pool, a children's playground, three floodlit tennis courts and options to play table tennis, beach volleyball and mini football. You can also have your fill of watersports at the beach, with pedalos and canoes, go windsurfing, waterskiing and sailing. Kids can enjoy waterslides and rides at the Hydropolis Waterpark next door. There is also lots of entertainment in store for kids, who can enjoy their own mini-club. Check into the spa to unwind in the heated indoor pool, the sauna, enjoy a steam bath, hydromassage and rejuvenating Cleopatra's bath. Don't miss out on the themed nights and beach barbeque parties in the evenings. The Gelina Village stands on the eastern side of the 8 km sandy beach of St. George's Bay. A short distance away is the beautiful natural reserve of Lake Antinioti and the coast of St. Spyridon, where you can discover tiny coves and small islands. 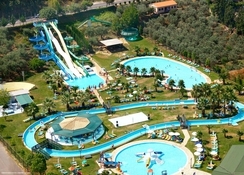 Note:- water-park will be open only during summer vacation and that is between MAY to mid October. This excursion will be arranged by the hotel. Clients need to request it in the reception upon their arrival. This is our 6th year staying and love this place, staff so friendly, food lovley and nice variety...and not a Mcdonalds in sight! :), rooms clean and housekeeping visit every day, pools clean and plenty of loungers available, not bothered about waterpark being shut and we were offfered alternative but didn't use, entertainment was a bit repetitive and would be better if more organised. Don't beleive the bad reviews, this place is perfect for a great week away and we will definitely be back. I saw a lot of negative reviews on trip advisor before leaving which concerned me. However when we arrived the staff were incredible, the room was basic but clean and perfectly functional. Food was repetitive after a few days but I don't go abroad to just eat in the hotel so not a concern for us. Souvlaki served every day during lunch, which was lovely! The biggest problem we had were with the rude, ignorant idiots by the pool. A group of people who thought it was fine to abuse the staff and be horrifying examples of British holiday makers (on behalf of all Brits, I apologise to the all of gelina village). We went out of season at the beginning of October so the water park was closed which was a shame. Oh and the Greek word for Zoo is the same as the Greek word for animal so there isn't a zoo, but there are some animals 😊 for what we paid this was an incredible bargain. Thank you to gelina for a lovely relaxing week away - I imagine we'll be back! Stayed all inclusive at the end of the season on October.Large complex with lots of different blocks of apartments. Great location close to beach and several nice pools. Food pretty good and always available. Staff friendly and helpful - especially if you learn a few words of Greek Good morning, thank you, sorry, and goodbye should do! Not particularly geared up for Brits. Lots of Russian and German. Plenty of alcohol on tap but no wild drunken behaviour - although a local told us it can get a bit rowdy in high season. Some people complained about ants - but it is a big, rural site and if you don't leave food around it shouldn't be a problem. Could have done with a kettle in the room!! Overall - we thought it was pretty good but wouldn't want to go if it was full, as could be a bit crowded.